We were pleasantly surprised by the rooms. They were clean and provided us with a quiet night prior to flying out the next morning. I loved the layout ...small semi detached units. Restaurant on property was fine, quiet, good food and the shuttle to airport and parking well organized . We will definitely recommend your hotel and probably stay again when flying from DTW. We were very pleased with the service and the hotel. 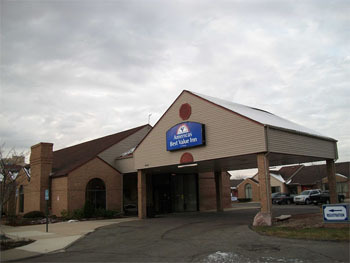 Rooms were clean, front desk staff was very friendly and extremely helpful. Good to know our vehicle was parked, by us, in a safe secure lot. Will use this hotel again for our travel jump off point. This was so far the best experience with the stay and long term parking we had in Detroit. The hotel is very conveniently located and the price was good for what we were looking for. Clean room, fast service and convenient parking. Room was very clean and comfortable. Front desk was very helpful and friendly. Shuttle was great, no stress on time and car is parked in a secure lot. Would stay here again. Very convenient. Great front desk service, clean rooms and awesome on-time shuttles. Park and sleep is so much more convenient and cost effective than paying for the parking ramps! The front staff were exceptional friendly and helpful. The room was very clean. Sink drain could use a little attention. It's an older hotel but the grounds and interior were clean. Great value for the money. Stay was May/2018 but website will not let me pick the correct date. Excellent place to stay although we only spent one night, convenient on site restaurant. Staff very accommodating.